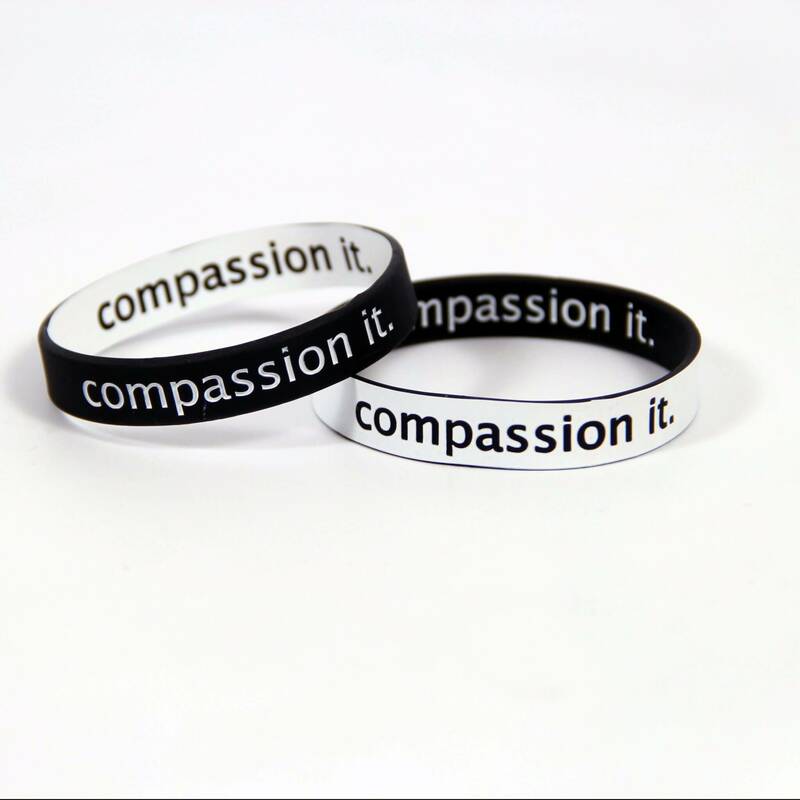 Please note that we have two sizes for our black & white bands. The small size – 7-inch circumference – fits children, most women and some men. The large size has an 8-inch circumference. I love the bracelet! What a great way to remember to be kind and serve others. I got the small, and it fits me (7 inch wrist), but it’s a bit tight to slide over my hand. It’s fine once it’s over! Funny story-the first day I wore this wrist band I found someone’s wallet in the shopping parking lot. I delivered it to the store’s manager to locate the owner. I was able to turn it over the very first time I put it on, but I haven’t seen it since. It just disappeared. 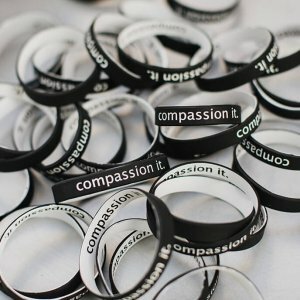 Love the Compassion It mission! 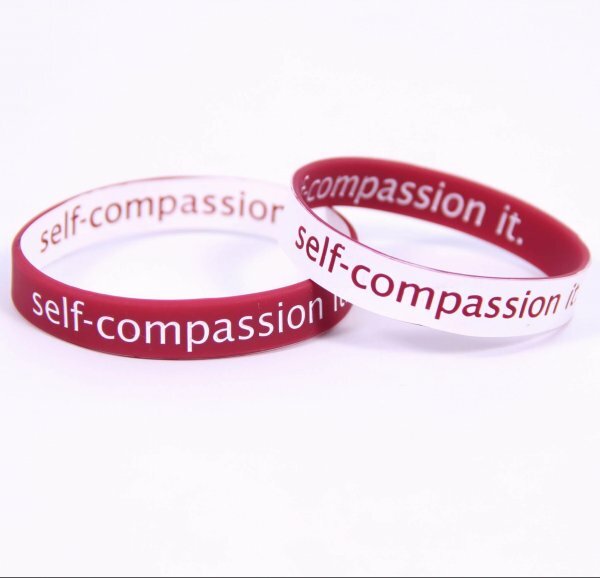 The wristband serves as a friendly reminder to act compassionately every day. 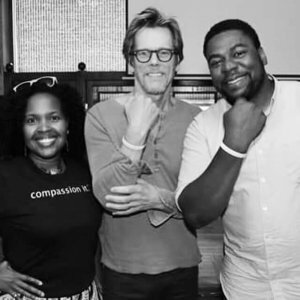 It’s also a great conversation piece… Strangers have inquired about the meaning of the bracelet and become inspired after hearing the Compassion It story. Love it and highly recommend!! The wristbands make perfect gifts too. I have had my wristband for about 5 years now, and I plan on having it until it eventually wears out. Definitely keeps me in line at times. 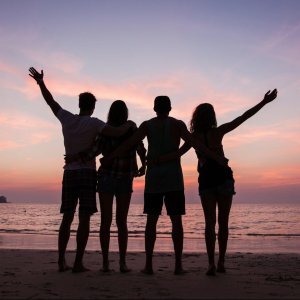 I have also given plenty of others away to friends, family, strangers. Love the “Wear One, Share One” idea. It is really neat to see that something so simple can really have a lasting effect, not only on myself but others.